It was hard to pick only three of the worst lies from Barack Obama’s speech today, but we did it. Remember when Barack Obama said Republicans are afraid of widows and orphans, that was right before women and children became suicide bombers. He’s still saying it and it’s patently untrue. The Breitbart London editor picked up this massive lie by Barack Obama. He actually lied to the UN with statistics that directly contradict those of the UN. He’s lied to them before. Take the lie about the video causing the Benghazi “protest”. 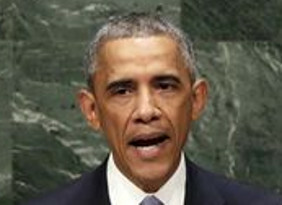 Globalist Obama just plain lied about poverty in the U.S.
Obama thinks he solved the Iranian nuclear crisis. He’s made it worse. Look at how much the Iranians respect us now – constantly harassing our ships. We sure taught them. His opening paragraph was a massive lie but my favorite was him saying he solved the Iranian nuclear crisis with diplomacy. The Iranian nuclear deal guarantees Iran will have the bomb and he sent them billions in wire transfers to help them proliferate and lied about it. How is that strengthening the nonproliferation regime? Barack Obama doesn’t believe in the United States or any sovereign nation, he believes in globalism. He wants to redistribute our wealth throughout the world and the other nations will readily take it but if he thinks dictators will give up their little fiefdoms, he’s truly insane. The entire speech proves he lives in an alternative universe.